Nobles employed squire-carvers to cut meat at table as part of the dining ritual Carvers used two knives, one to cut the meat, the other to hold it steady, and carry slices to the diners. Knives were both portable and personal objects. The leather sheath for these knives has loops to attach it to the carver's belt, and the painted coat of arms on the sheath indicates the owner, but is now defaced and impossible to identify. Owning fine cutlery in the 15th century was a sign of wealth, elegance and refinement. Using elaborate carving knives and cases lent dignity and splendour to the serving of meals in noble households.The wealthy and the nobility employed Squire Carvers to cut and serve meat in a ritualised performance. At the beginning of a meal the carver laid the knives on the table pointing towards the master. To emphasise that this was not a threatening gesture, he would cover them with a white cloth. The religious inscriptions on the knife reflect the owner's piety. The knife was the main eating implement in Europe until the middle of the 17th century. The basic form of the table knife was quite different from these, and was a single-edged blade more or less pointed, with a handle, which has remained virtually the same since Antiquity, although the details of construction, shape and decoration have varied. Smaller knives used for cutting and eating, were similarly kept in portable cases as it was normal practice for everyone to carry their own cutlery. Dinner hosts, from nobles to inns and hostels, rarely provided cutlery so it remained individual and personalised. The provenance of the cutlery set until the 19th century is not known. It was bought by the Museum from the Bernal Collection in 1855. This was an enormous collection of metalwork, glass, ceramics and miniatures belonging to Ralph Bernal, a lawyer and MP. The sale by Christie, Manson and Woods took 32 days during which 4294 lots fetched nearly £71,000. The Museum bought 730 lots including this cutlery set for which it paid £49.10s. Historical significance: The attribution of these knives to one of the princely households of France (and possibly Burgundy) is on the ground of the fleur-de-lys, emblem of the Kings of France and all the French princes, among whom the Dukes of Burgundy kept the most sumpuous court. However, there exists a number of carving knives with handles of silver-gilt, enriched with transluscent enamel, mostly bearing the arms of Philip III, Duke of Burgund,y as assumed by him n October 1430. These differ from the V&A set in form and ornament and so no certain attribution can be made. This is princely cutlery. Owning fine cutlery in the 15th century was a sign of wealth, elegance and refinement. Using elaborate carving knives and cases lent dignity and splendour to the serving of meals in noble households. Wealthy nobles employed Squire Carvers to cut and serve meat in a ritualised performance. At the beginning of a meal the carver laid the knives on the table pointing towards the master, but to emphasise that this was not a threatening gesture, he would cover them with a white cloth. For carving, one knife was used to cut the meat and the other to hold it steady and to carry slices to the diners. 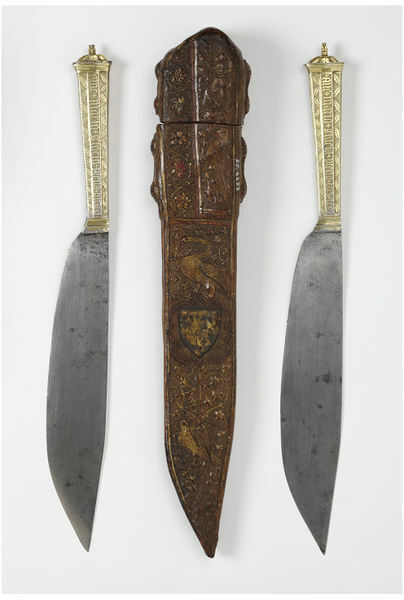 The religious inscriptions on the knife handles emphasise that good meat was not to be taken for granted during the 15th century. The leather case indicates how cutlery was regarded as portable. The case has hoops for attaching it to the carver's belt. The coat of arms, largely rubbed out, tied it to its owner. 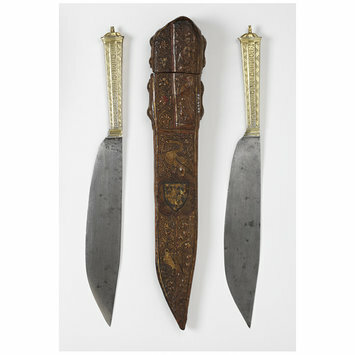 Smaller knives used for cutting and eating, were similarly kept in portable cases as it was normal practice for everyone to carry their own cutlery. Dinner hosts, from nobles to inns and hostels, rarely provided cutlery so it remained individual and personalised. Campbell, Marian. [Catalogue entry]. In: Charles Le Téméraire (1433-1477): Faste et Déclin de la cour de Bourgogne. Brussels: Fonds Mercator, 2008. p.290, no.115, ill. Catalogue of the exhibition held Musée Historique de Berne, 25 April - 24 August 2008 and at Bruggemuseum & Groeningemuseum Bruges, 27 March - 21 July 2009. Handles of engraved and pierced silver-gilt, enriched with translucent enamel; the sheath of cut and embossed leather (cuir bouilli). 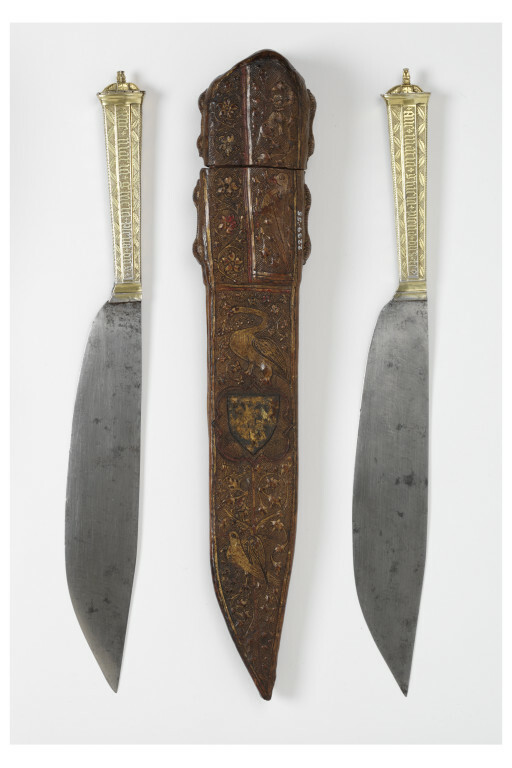 The attribution of these knives is based on their fleur-de-lys decoration, emblem of the Kings of France and all the French princes, among whom the Dukes of Burgundy kept the most sumptuous court.